For Non-Project Managers, how to run a Project? I am increasingly seeing that Projects need to be run by individuals without Project Management as their core skill set. So I thought it worthwhile writing a summary of what I believe they need to focus on when taking on such a role with some links for more information if they want it. There are 3 steps to running a Project remembering that it is a temporary venture. DEFINE your project else you may head in the wrong direction! 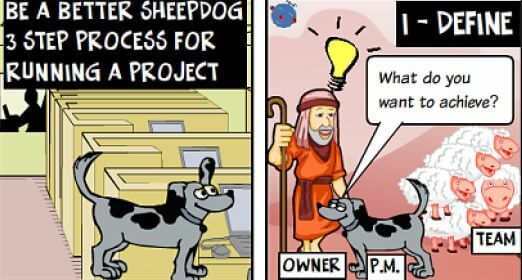 I am keen on analogies and proverbs as a means of getting a message across and the Be a Better Sheepdog site is full of them, so let me explain why a Sheepdog is an analogy for a Project Manager and relate this to the 3 step process. The Sheepdog brings order to the "team" of sheep and ensures they are heading in the right direction. But the Sheepdog doesn't make up his/her own mind where to head, the owner decides that and communicates with the Sheepdog. Projects are exactly the same. 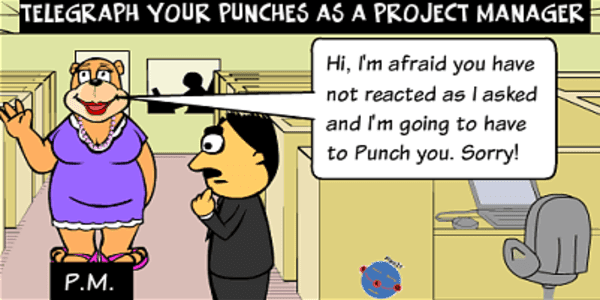 So always determine who your Project Owner is; we call this role the Project Sponsor. Often a project is started when the owner isn't clear. So your first task is to find your Sponsor!, this person should have the most to gain from the project or we say owns obtaining benefits from the project. Once you have found your Sponsor you can agree what the objectives, scope and success criteria is? Back to the Sheepdog analogy, to achieve the objective the dog may need to head off behind the sheep and drive them in the right direction; in real projects you should involve your team in your planning, a little breakdown in the analogy! Once you have a plan you have something to monitor progress against. However, often when I see non-project managers running projects they have another role within the project team. The danger is that you just focus on this "doing role" and forget the Project Management. So I recommend that you block out a couple of hours towards the end of the week say on a Friday morning, please put a reoccurring meeting in your calendar to stop others arranging a meeting and to give yourself a nudge "this is my Project Management time". are we are on track for our next milestones? look ahead to up coming activities, is there anything we need to do early next week to prepare? Make some notes and I suggest that you always have your team meeting on a Monday morning where you can have a discussion about progress but you are prepared to talk about what needs to happen in the forward week from the review you had back on the Friday. Going back to the Friday 2 hour review slot, this is a good time to write and send out a status report and keep your Sponsor and any other stakeholders informed, try and be honest with yourself and if you think you are slipping against the milestones you have established say so. I would also organise a regular schedule of meetings with your Sponsor, a minimum of once a month but sometimes more often (agree with your Sponsor). Hopefully you will achieve your milestones and deliver the Project. A Project doesn't last for ever, it just seems like it sometimes! So eventually it is time to close the project down. I would always have a review session with the team looking back, what went well, what could we have done better? We call this Lessons Learnt. You should also reflect on what you have done as a Project Manager, things to repeat next time and maybe things to do differently? The chances are that you will have another opportunity so best that you look to improve your performance and that applies whether that was your first project or your 100th! Hopefully the Sponsor has enough money for the team to have a celebration as well especially if the project is deemed an ultimate success. Even if you read no further, I think you have a framework above to be a Project Manager. There is actually a lot more to consider to get the best results in projects, I wrote a post on where to spend your time which you might want to take a look at but there are topics such as Risk Management (Attack the risks before the risks attack you! ), Issue Management, Change Management - lots to manage! You should never forget that Projects are delivered by a team working together successfully so always remember the human side when working with the team. 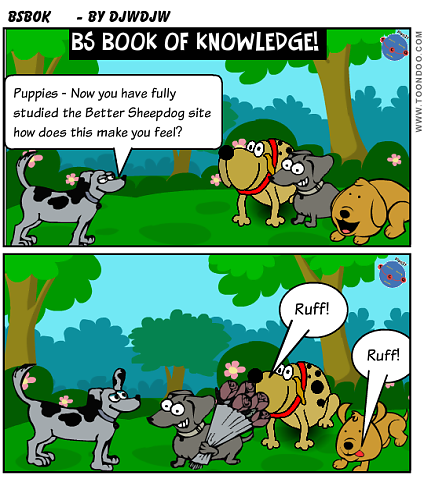 To prove that you have studied the Better Sheepdog Book of Knowledge (BSBOK) requires an Examination which is in the form of a crossword puzzle as Project Managers need to be able to solve puzzles to deliver their Project! Anyone emailing successful answers to bettersheepdog@gmail.com will go into the Hall of Fame. Please supply your name and your personal Project Management slogan / comment. 23. 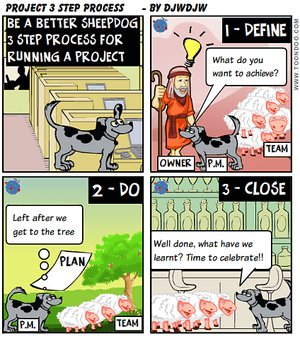 According to Better Sheepdog, Resource Planning could be better described as “Establishing your what” (7,4)? 1. Honest communication is an important behaviour to look for in a Project Manager. Complete the Proverb "The most valuable and least used phrase in a Project Manager's vocabulary is x xxxx xxxx (1,4,4)"? 13. Before embarking fully on Project execution what document should be used to confirm that organisation funds and resources are being used on the correct Project (8,4)? 35. 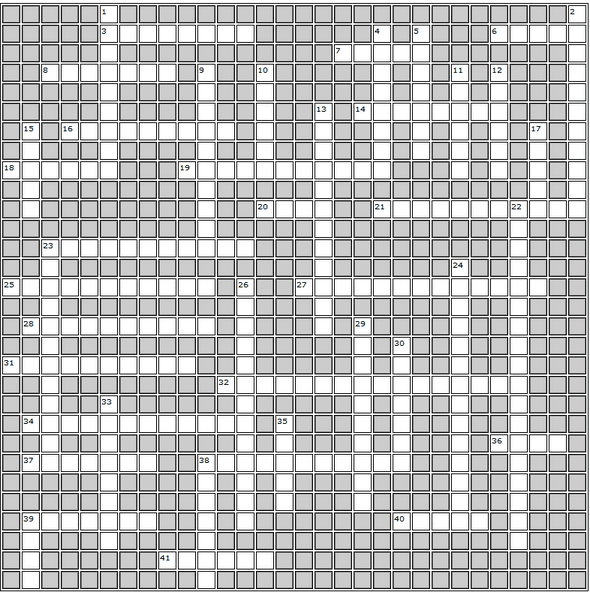 What is suggested to manage stress in the Proverb "A xxxxx a day keeps the stress away!"? 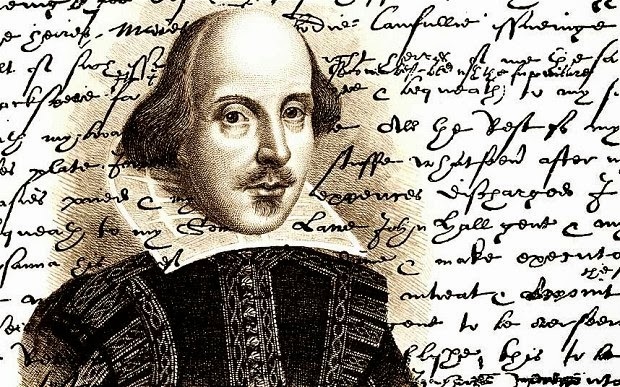 Do famous quotes have relevance for Project Managers and Project Teams? Can they can be an inspiration in certain situations? Yes, is my answer! Here is a selection I have picked with their relevance described. Churchill meant this in terms of Political Risk but it could apply to Project Risk. 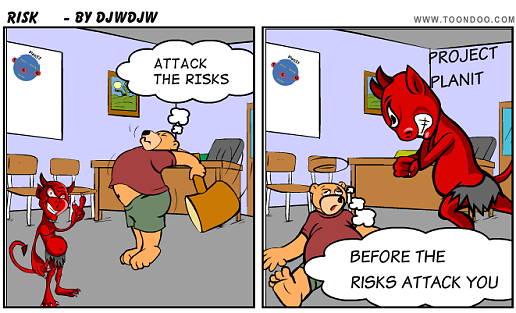 The way I have previously described it is Attack the Risks before the Risks Attack you! Alternatively, the Churchill quote reminds me of an important behavioural characteristic for Project Managers. As a PM you need to be prepared to stand your ground and not duck issues. I covered this and a number of other characteristics in this post. Kettering puts it very succinctly. Define your problem statement when you have an Issue and it helps focus the mind on the potential solutions. It is worth keeping these quotations in mind when in the heat of arguments within the Project team or with other stakeholders. As a Project Manager you need good self-motivation and always have in sight the ultimate goal. Read this post for other behavioural traits of a good Project Manager. As a Project Manager you need to cope with stressful situations at times and this quote is useful to remember. Read this post for more on coping with stress and worry. 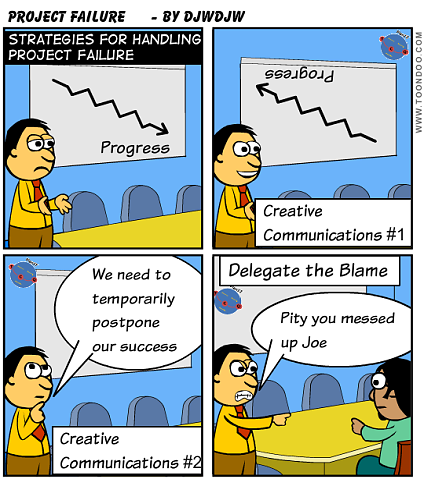 As a Project Manager you need good time management skills. I always start the day by working out the key things to achieve in the day. I try and address the things of most importance to the Project(s), not the easy things to tick off or the activities I prefer. I have found Organisations mixed in their approach to learning lessons from previous Projects. However, on a personal level, there is no excuse and I always make a point of considering what has gone well with Project execution, what less well and what I should aim to do differently next time.